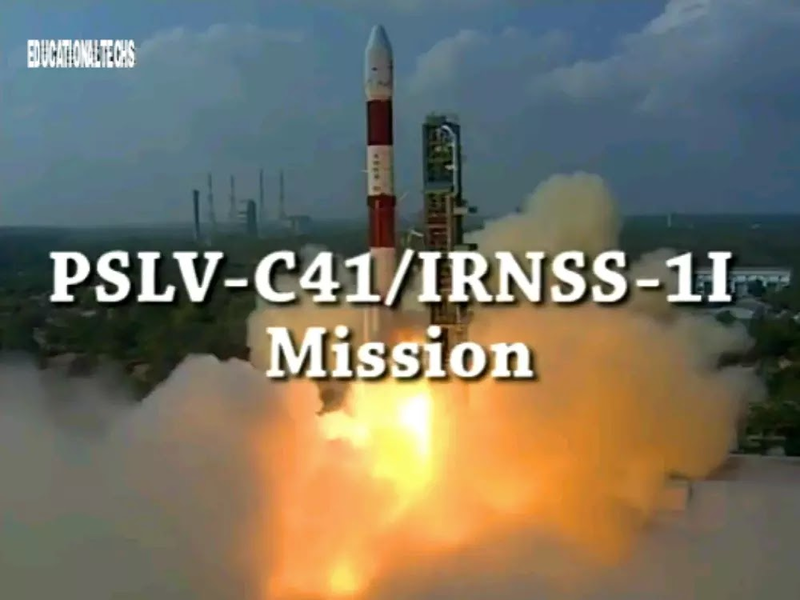 On 12 April 2108, Indian Space Research Organisation ( ISRO ) has successfully launched the Indian Regional Navigation Satellite System - 1I ( IRNSS - 1I ) navigational satellite with the help of four stage Polar Satellite Launch Vehicle - C41 ( PSLV - C41 ) rocket. The successful launching of IRNSS - 1I has taken place from the first launch pad of the Satish Dhawan Space Centre ( SDSC ) Shar situated at Sriharikota in coastal Andhra Pradesh. SDSC Shar was built on the concept of ' Integrate on the pad, in which the individual stages are stacked one over the other on the launch pad itself'. The official launch time of launch was 04: 04 AM Indian Standard Time on 12 April 2018, Thursday (06: 34 PM ) EDT or 2234 GMT on 11 April 2018, Wednesday.Currently, ISRO's team is working re-establish the link with GSAT - 6A communication satellite. IRNSS - 1I is the eighth satellite of Indan Regional Navigation System ( IRNSS ) constellation. In actual IRNSS - 1I is the ninth satellite that launched IRNSS constellation but it is counting as eighth satellite because IRNSS - 1I is an eighth satellite that has launched successfully IRNSS constellation. ISRO already launched IRNSS - 1A, IRNSS - 1B, IRNSS - 1C, IRNSS - 1D, IRNSS - 1E, IRNSS - 1F, IRNSS - 1G, IRNSS - 1H. But due to some technical error IRNSS - 1H could not launch successfully and PSLV placed the satellite into a lower than expected orbit. According to reports collected from media, the satellite was also stuck inside the rocket's fairing which prevented the IRNSS - 1H from deploying as planned. As the the launch of IRNSS - 1H is failed, so we do not count it for IRNSS constellation. ISRO launched the IRNSS - 1I as backed up by the IRNSS - 1A satellite, Because the rubidium atomic clock that used on IRNSS - 1A satellite has stopped working. The Rs 1,420-crore NavIC suffered setback in January last year, when three rubidium atomic clocks of IRNSS-1A put into orbit on July 1, 2013, Out of nine satellites ( eight successfully launched and one failed ) each satellite contains three rubidium atomic clocks , hence total 27 rubidium atomic clocks has supplied from Europe for navigation satellite system .The clocks are important to provide precise data. According to reports, the rubidium atomic clock of sixth satellite IRNSS -1F also stopped working, so ISRO's team may launch another satellite for backup of IRNSS - 1F. Just nineteen minutes after the successful launch of IRNSS - 1I moved into an orbit that will transfer the satellite into its final orbit which is geosynchronous orbit.Currently it is moving in a temporary sub-geosynchronous oval path about 281.5 km x 20,730 km from the Earth and inclined 19.2 degrees to the Equator, In few upcoming days, the orbit maneuvers will be performed from Master Control Facility ( MCF ) to position the satellite, gradually pushed in the coming days into a geosynchronous circular orbit 36,000 km away, over 55° East longitude in the planned geostationary orbit, at an inclination of 29 degrees of the equator , ISRO said. After initial orbit raising maneuvers, IRNSS - 1I will join the IRNSS constellation to provide the navigation services. How IRNSS - 1I Satellite Will Work? Like its predecessor, IRNSS - 1I has two types of payloads, navigation payload and the ranging payload. The navigation payload operating in the S and L5 bands transmits the navigation signals to the users. The ranging payload comprises of transponder which is operated in CDMA mode for two - way range measurements. The IRNSS satellites continuously emites time stamped navigation signals, which are received by the ground-based user receivers. The information is then processed by the receivers to derive their own position, velocity and time.The system provides the seamless 24 by 7 services under all weather condition. NavIC, the " Navigation with Indian constellation ". is Indian Navigation System aimed at providing reliable navigation services. The system has developed for providing accurate information on the position, velocity and time to the users. It provides position accuracy better than 20 meters over Indian landmass and in the surrounding region extending about 1500 kilometers from its boundaries. The navigational application will be very useful and provide long-term benefits to all users be it the common public or the advanced users like railways, airlines, maritime operators, strategic users and many others thus contributing significantly for overall national development. Meanwhile, ISRO's team is also working continuously to figure out the GSAT 6A communication satellite in the space and to Re - establish link with GSAT - 6A. GSAT - 6A is a communication satellite that launched by ISRO on 29 March 2018 at 04: 56 PM from the second launch pad of Satish Dhawan Space Centre ( SDSC ). But just a day after the launch of GSAT - 6A satellite ISRO's lost the link GSAT - 6A. Earlier we have notified ISRO's team figured out where the GSAT - 6A satellite is in space. As ISRO launched two satellite within fifteen days only, ISRO is increasing its frequency of launches in recent years in order to meet the national requirement of satellites in the areas of communication, earth observation, and navigation. ISRO planned eight launches in this year. Out of these satellites launch of GSAT - 11 will be more important launch. GSAT - 11 is 5-ton satellite which will launch by ISRO with the help of Ariane rocket from Guiana Space Centre. Ariane is a series of European civilian expendable launch vehicles for space launch use. ISRO will also launch the GSAT 29 with help of GSLV Mk III D2. GSLV Mk II D2 is known as ' Fat Boy'. After launching GSAT 29 ISRO will execute DIGISAT by GSLV. In which ISRO will launch high-resolution remote sensing satellite. Apart from these GSAT 7A will also launch by GSLV. Further ISRO will launch Chandrayaan 2 in October.